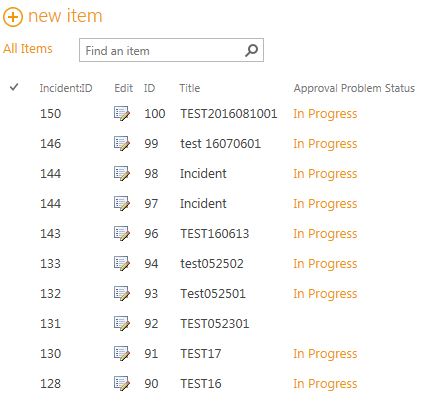 I have the following list in a sharepoint 2013 site. I would like to remove the "Approval Problem Status" hyperlink from the list view. In this case is showing as "In Progress" but I only want to maintain the text. This field comes from the default Approval workflow and I'm just showing the status if approved or not. I have already tried this link and this link but with no success. Any other options? And this works for any hyperlink column of the list view including lookups. Can you create a calculated field to =[Approval progress status] ? Then add this to the view and remove the original? Not the answer you're looking for? Browse other questions tagged list workflow hyperlink or ask your own question. Despite completing the task in Workflow (Approving the Document) , Workflow column in doucument library showing Work In Progress? How to make a running workflow to complete state in sharepoint 2010 Out Of The Box (OOTB)?